Hello Fellow Crafters and Sketch Lovers! It's time for this week's Featured Spotlight Cards from last Saturday's sketch (SSS144). Thank you all for participating. First is Becky's darling card. What a sweet image and fabulous coloring! Love the blue colors. The flower embellishments and key charm are just lovely. 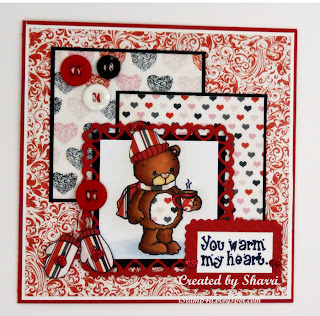 Next is Sharri's sweet card. Darling Rhubarb looks gret paper-pieced. Fabulous papers and cute buttons! The dangling mittens look great. 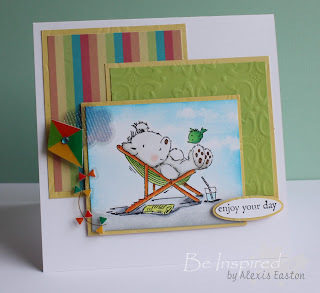 Lastly, it is Alexis' super cute card. Love the sweet image and the awesome coloring. The card has such a great clean look. The kite is just the perfect embellishment. Congratulations Ladies! Please feel free to grab your badge below and add it to your blog sidebar. Thank you for sharing your amazing work with us! Hope we will see your creations again. It's always hard to pick only 3 cards to feature. They are all fabulous, so keep playing along with us! You just might be our next Sweet Stop Spotlight! Check back tomorrow for a fabulous new sketch! Thanks for playing along with The Sweet Stop. We love hearing your comments and seeing your creations! Right click and save to your computer. Looking for a previous sketch? Power Poppy Creative Confetti Challenge - Think Spring! Sweet 'n Sassy Stamps. Delightful Daisies. You are more than welcome to copy the artwork we share with you on this blog, however please do not copy anything for publication or contest submissions. Let's play fair and keep blogging fun. Thank you! We reserve the right to remove any links we feel do not represent wholesome, family friendly attitudes and themes. Thank you for understanding. Subscribe to the SNSS Newsletter! Receive updates from the Sweet 'n Sassy Stamps website.